A quorate cabal assembled to damage bottles, and in a shocker the review is posted the next day. Wonders, they never cease. 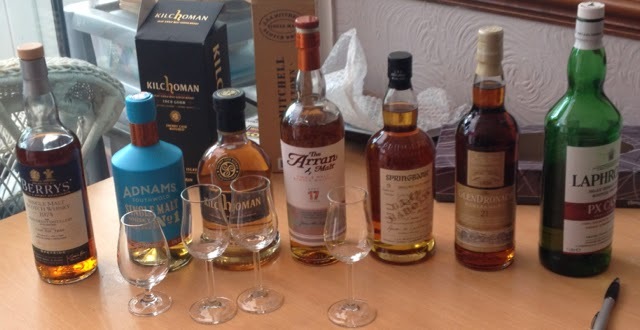 All of us had one or two bottles for tasting, and unusually, no SMWS featured. We did think about grabbing some while raiding Alec's cabinet, but decided no, not this time. Links are to the Good Spirits Co. in Glasgow, who we've adopted after the debacle of Loch Fyne Whiskies. So far they've been helpful, funny, and get the booze to us the next day. Withnail would approve. A bottle for Rich's birthday, this was a sherry monster of superb quality. And yet, for a 37yo whisky, it had attitude, there's fight left in the old bugger yet [makes you wonder what it tasted like 20 years ago...]. Absolutely superb example of an old, classy, sherried Glen Grant. It's only just whisky (3years 1 day), and there's something about it that we thought tasted wrong. It's not bad, it's just not good. There's also an absence of complexity (and aggression) that suggests more ageing won't improve it either. We all agreed that if you saw it at the pub, we'd drink it in preference to a number of other pub-type whiskies, but over all - not a big win. Arran have been quite interesting to follow over the last few years, their 10 and 12yo releases promised much, but had the feeling they were still too young. But every so often an independent bottler (SMWS usually) released an absolutely stunner - our group reviewed their ginger release way back at Cabal 2 - with all of us picking up a bottle, apparently Dr Death still has some and has promised to bring it to the next meeting (huzzah!!). I've picked up Arran's every so often and liked them, and what we've noticed is that their house style has settled to a light, floral and fruity whisky with an interesting background of ginger. Obviously their sherry finish loses the ginger, but still we like those too. We liked this one, a lot, it's quite surprising with the nose and palate not really matching up, but in a good way. Arran are releasing an 18yo next year, and will continue with an 18yo in their standard range. Alec picked this up as we all like Springbank, and it's an interesting wee dram. Very fighty (eric) neat, but quite warming and pleasant with water. Good Spirits Co describe this as "Christmas pudding in a glass". We can't improve on that description - it's damn near perfect as a sherry monster. With the Glengoyne teapot dram increasing in price every year we think it's worthwhile keeping an eye on the Glendronach range - we've never had a bad one, in fact we've had some very very good ones. Like this. Go forth, buy it. Only available in duty free (hence link to Laphroaig's homepage, not Good Spirits Co.) we've tried this before, but as Alec wasn't at that tasting I dragged it along again. We do like it. And none of us are fans of Laphroaig - aside from the very expensive old ones [me] and the Quarter-cask [also me], most Laphraoig is too vicious and not very complex. So if you see the PX in duty free, pick up a bottle, it's everything Laphraoig isn't. So, another good tasting with a wide range of flavours - and scores. I'm also going on record to say I'll produce a Pub Whisky summary within the next month. There, happy now? eh? bastards. Today I've been spinning new music on Spotify. This started out reasonably well with a swedish metal band 'Astrakhan', sort of Symphony X but more under control, and yeah hints of Pain of Salvation. I liked it, possibly not enough to buy the album, but I'll spin them again and if/when a new album comes out will give it a go. Next up was Sean Kuti + Egypt80's new album 'a long way to the beginning' which is brilliant. He's quite pissed off, and that's a good thing (musically). And then things took off on a tangent. Actually tangent maybe being too kind, I found Troll Bends Fir. A folk-metal / beer-folk band from Russia, where most lyrics, songs, albums appear to focus on beer and brewing. This I can both cope, and get onboard, with. Wikipedia. There's a lot of tin whistle/flute, and violin, and one song appeared to consist of singing 'slainte' over a metal beat and fiddle accompaniment. Ideal drinking music. Album titles reflect their central premise: Hopheart, Brothers in drinks, 1516/Order of the Holy Hop. Can't seem to find a band camp link for them, and kinda refuse to link to myspace or facebook. so have a youtube video instead.